Many people do not like to take greens/keerais. 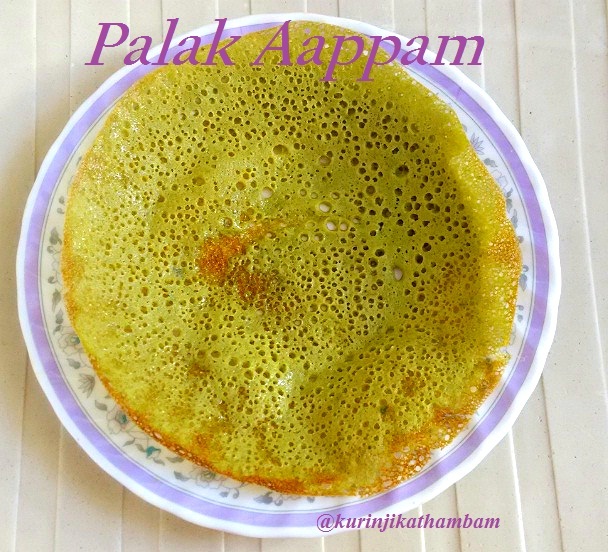 For them palak appam is a good option with palak aappam you get nice green color and also no difference from normal white aappam. Kids also will love it for the color. 2. Then switch off the flame and put the washed palak leaves into the hot water. Remove the stem if the stems are very strong, otherwise use the stem also. 3. Leave it for 2 mins and remove it from the water and strain it completely. 5. 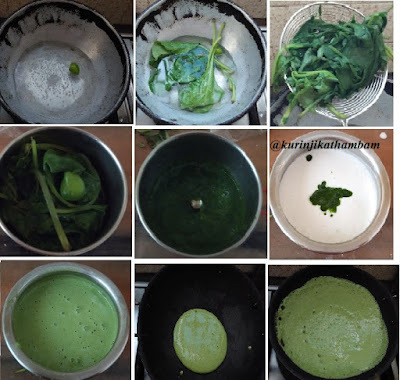 Now mix this palak paste with aappam batter. Mix them well and keep it aside for 5 – 10 mins. 6. Heat the aappam pan and pour few drops of oil. Then pour 2 ladle full of batter into the pan. Now rotate the pan in a circular motion, so that the batter spreads all over the pan. See the video for how to make the aappam. 7. Now pour few drops of oil and close the lid of the pan. Cook for 2-3 mins. 8. Then take it out from the pan and serve it hot with Tomato chutney. Click the following video for how to make flower aappam.